Galleria Vittorio Emmanuel II is considered to be the world’s oldest shopping mall. Here you may find all the luxury shops selling not only fashion, jewelry and accessories, but also books and paintings. Among the range of world-known brands there are Prada, Valentino, Roberto Cavalli, Dolce and Gabbana, Versace and others. Galleria is also the location of some of the oldest cafes and restaurants of the city. 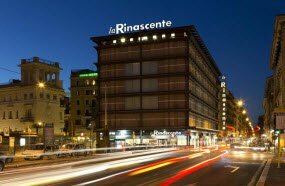 La Rinascente is a department store which comprises under its roof both elegant and avant-garde items. The building houses an exclusive selection of shoes and clothing for men, women and children, accessories and cosmetics and even houseware. There is also the Food Hall, food market, several restaurants and a roof top terrace with the spectacular view of the city. All major credit cards are accepted at La Rinascente. Note that tax-refund service is available here. 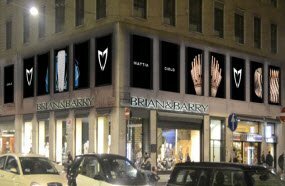 Brian & Barry is a place which combines numerous departments, all of which are marked by the highest quality of these items. In the nine retail floors of the building you will easily find clothing, shoes, accessories, cosmetics, electronics, houseware and food. On the ninth and tenth floors there are a restaurant and a lounge zone. You can also enjoy the panoramic view of the city from one of two terraces of the building. 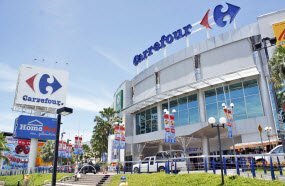 Carrefour is a well-known European chain store with huge selection of goods. The prices may be a bit higher than in other chains, however the first-class quality is worthy of some extra payment. Here you will find the freshest fruits and vegetables as well as meat and any other type of food. You may even get tired because of the enormous quantity of produce so keep it in mind while scheduling your shopping. 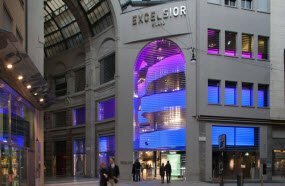 Excelsior Milano is an extraordinary and innovative shopping center created on the place of Milanese cinema. Its seven floors are marked by a stunning design and unique video installations. Here you can find various items of clothing, shoes, accessories, books, high-tech, houseware and fine food. Get a knick-knack at Tiffany & Co and a new workout look at Nike or Adidas. Make sure to make a stop at the luxury pastry shop Ladurée.